5-star Luxury ; Small Luxury Hotels of the World. 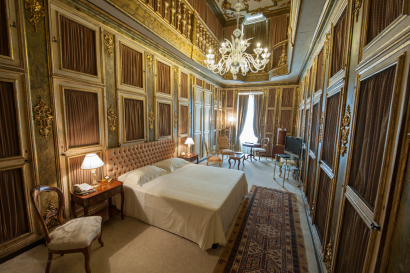 This palace was originally owned by the Morosini family and was purchased at the start of the 18th century by the Sagredos, a noble family who had lived in the Santa Sofia district for centuries. The surname Sagredo is a corrupted form of the world “secret”, as the family was said to be secret advisors to the emperor. They boasted remote Roman origins having been governors of Dalmatia who apparently arrived in Venice in the ninth century. There they joined the Great Council in 1100 as a results of their restoring the city of Sibenik to obedience to the Republic. 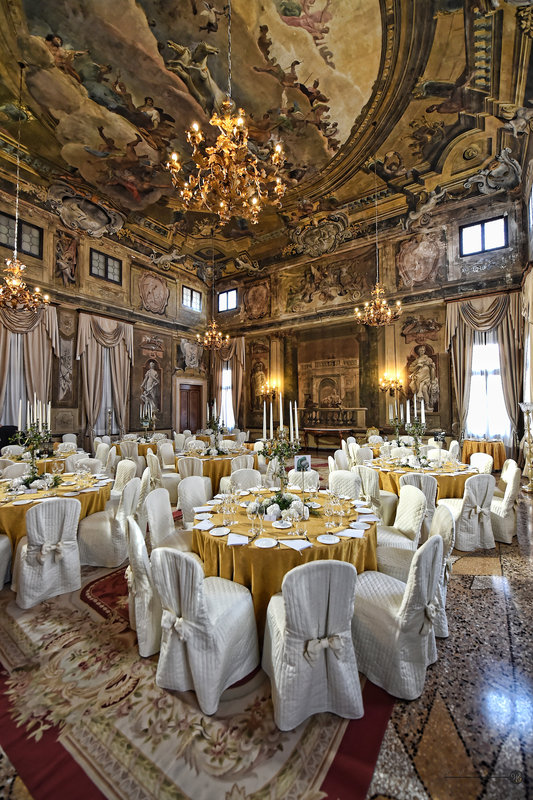 The palace was bought by the Procurator of St. Mark Gherardo Sagredo who had it renovated to make it suitable for the social standing of his family. He ordered the architect Andrea Tirali to design a grandiose indoor staircase to replace the long since demolished outdoor Gothic stairway. He had the walls of the new staircase decorated by Pietro Longhi in 1734 with a fresco representing The Fall of the Giants, inspired by Giulio Romano’s Battle of the Giants for the Palazzo del Tè in Mantua. 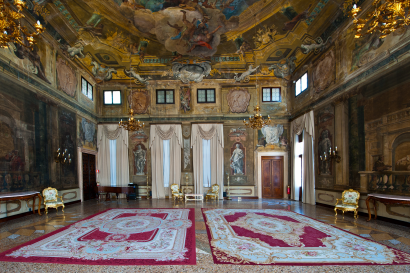 At the same time, the interior was luxuriously covered by Abbondio Stazio and Carpoforo Mazzetti Tecalla with stucco work, much of which is still in the palace. 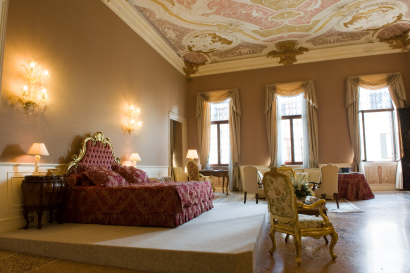 The same artists also created the decorations in the alcove, an exceptional example of a purely rococo-style bedroom, now preserved at the Metropolitan Museum in New York. 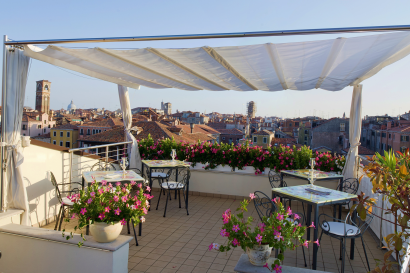 Venice is one of the most beautiful city of the world: you will have a great time exploring the labyrinth of streets and campos, shimmering canals and endless bridges, visiting glass factory makers and extraordinary museums. A Private Boat will bring you to explore the surroundings islands that once make up Venice. 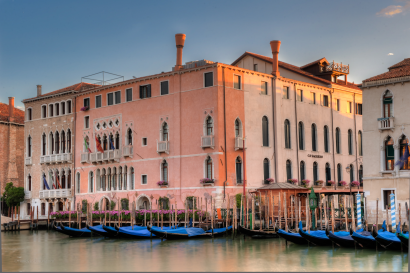 Furthermore, a private gondola ride will lead you along enchanting canals and lesser known views to admire some of the most characteristic palaces in Venice. 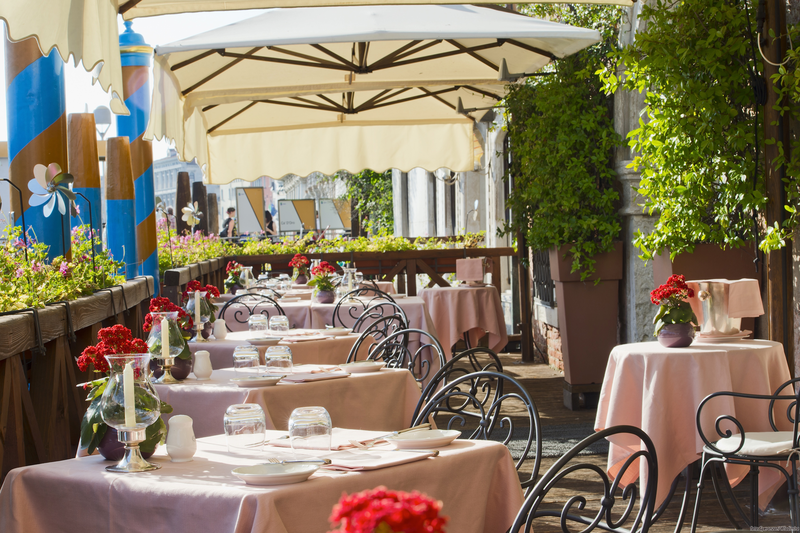 Embark on a journey as we show you our favourite hidden spots in Venice. 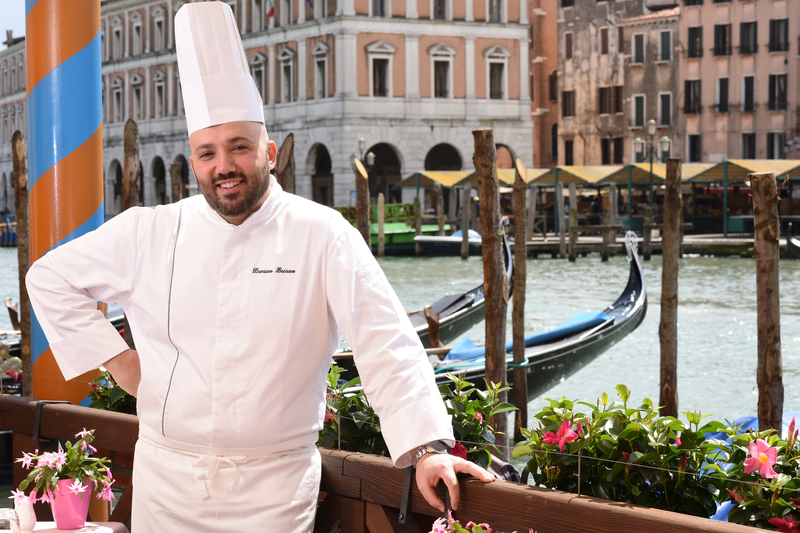 Cross the Grand Canal with our Chef to the Historical Rialto Market. 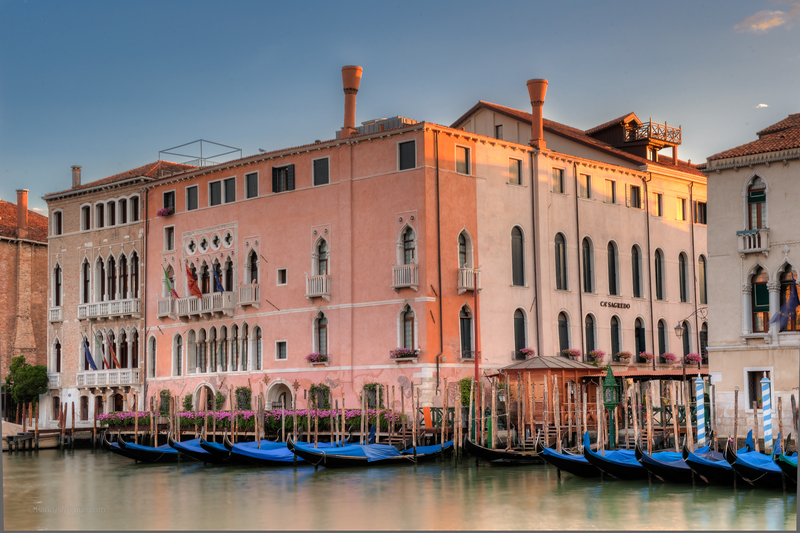 Learn how to shop, like a real Venetian, for fresh fishes and best local products. Discover traditional fragrances in a multisensorial experience. (Duration: approx. 40 minutes. Min 2 /Max 6 pax). Discover Chef’s best-kept secrets, be fascinated by the Art of Cooking under his attentive guide! You will learn how to prepare the food you have helped him to purchase at the Rialto Market (Duration: approx. 2 hours. Min 2 /Max 6 pax). 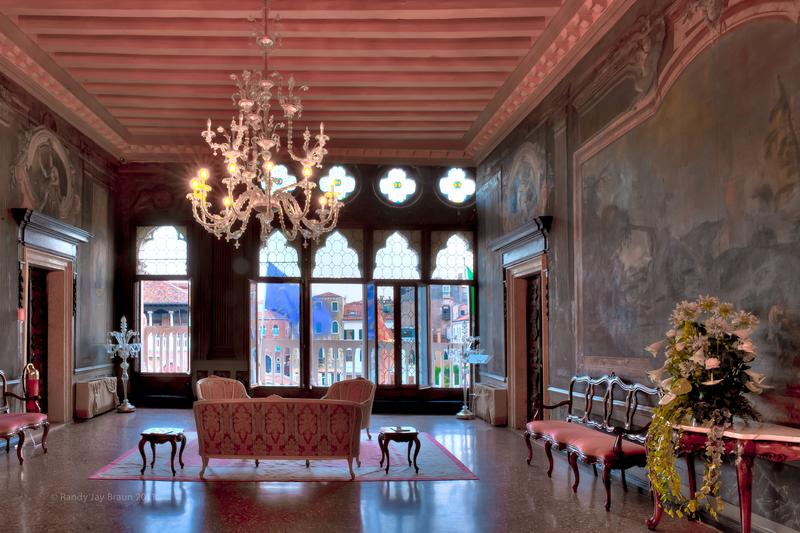 Tone up yourself with our special Personal Trainer and explore the hidden spots of Venice in a different way! Jogging and walking tours have been tailor-made to please everybody from beginners to advanced! (Duration: approx. 45 minutes or 1 hour. Max 2 pax). Free wifi in all the rooms and the common areas. the magical location on the Canal Grande with a panoramic terrace has inspired our Chef Damiano Bassano. The absolute protagonist is a cuisine made of fresh ingredients and characterized by a strong “Back to Nature” concept. Local delicacies are enhanced in his menus through the daily attentive personal selection from the Rialto Market: a “Natural Flavours Philosophy” providing a fresh twist on the authentic Venetian cuisine. 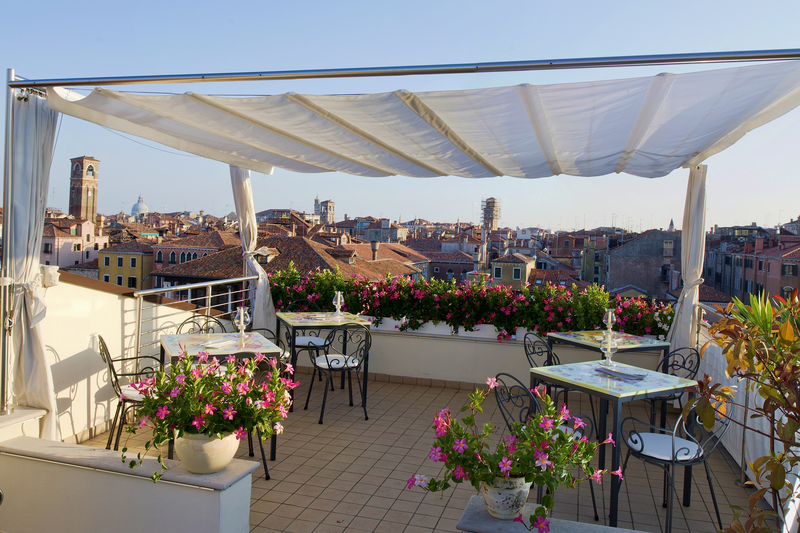 • Bar L’Incontro (open all year around, 7 days a week from 12pm) is perfect for aperitifs and after-dinner drinks. Fitness Area available 24h a day, free of charge. • Music Ballroom : capacity 100 people. 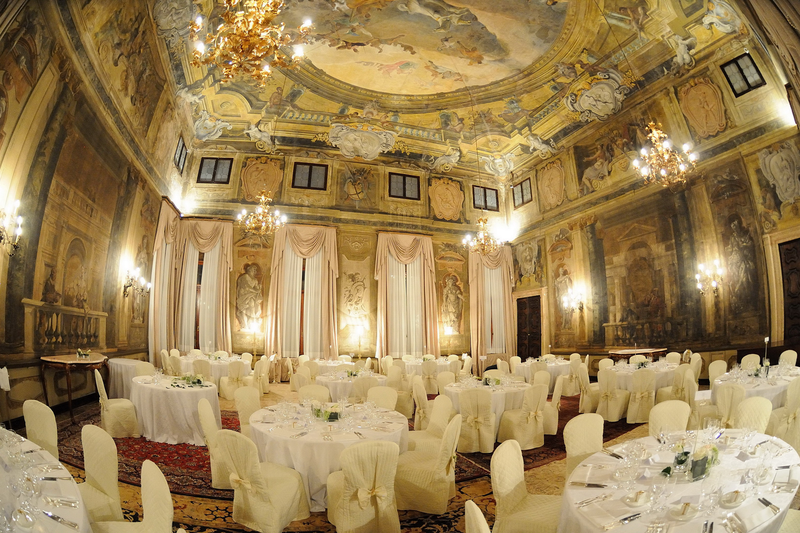 The main Ballroom in the Palazzo, will let you relive the pomp of the past. Still nowadays its perfect acoustic of this hall wraps its guests. • Portego : capacity 120 people. 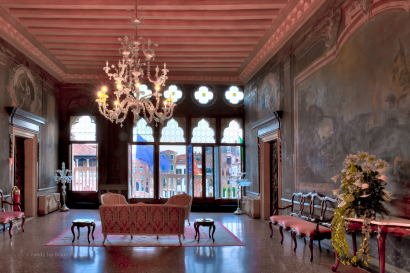 A typical architectural feature of Venetian palaces, is a huge high-beamed hall located on the piano nobile (noble floor) from which all function rooms lead off. • Amigoni Hall: capacity 40 people. 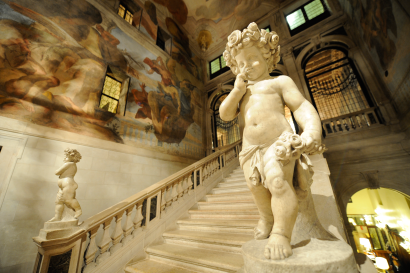 Adjacent to the Portego, was one of the first and most appreciated representatives of Venetian rococo, which in fact was also called “Amigoni’s style” in Germany. • Doge hall : capacity 30 people. 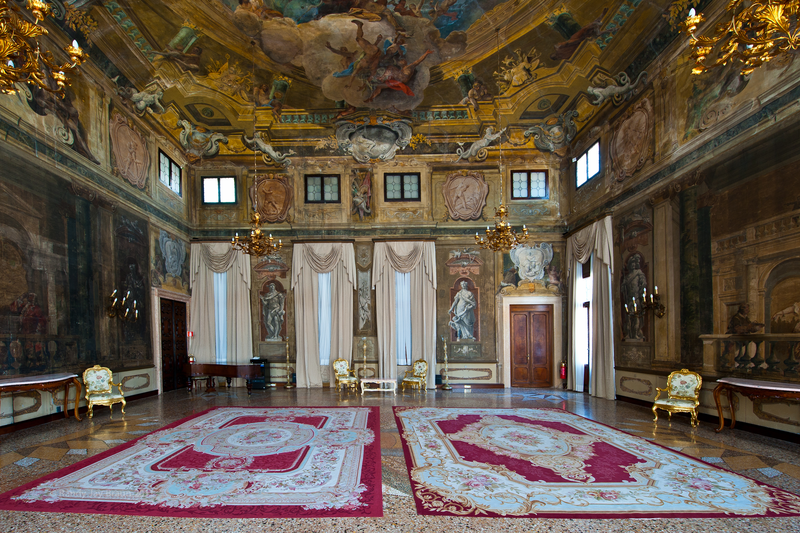 This wonderful room takes its name from Doge Nicolò Sagredo portrait which was once displayed here. • Tiepolo hall: capacity 20 people. This room, adjacent to the Ballroom, is dedicated to Giambattista Tiepolo (1696-1770), the “giant” of 18th century Venetian painting, to whom the oil on canvas “Homage to Venice” dominating the ceiling and still showing two flying cupids is attributed. Cooking classes : Discover Chef’s best-kept secrets, be fascinated by the Art of Cooking under his attentive guide! You will learn how to prepare the food you have helped him to purchase at the Rialto Market (Duration: approx. 2 hours. Min 2 /Max 6 pax).